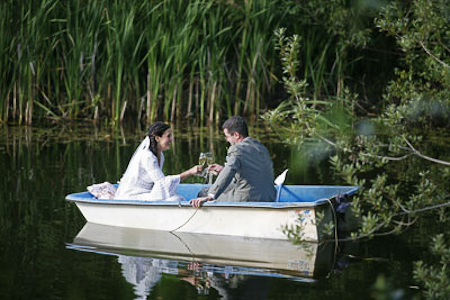 Losing one’s wedding site puts a bride and groom-to-be in a precarious position. 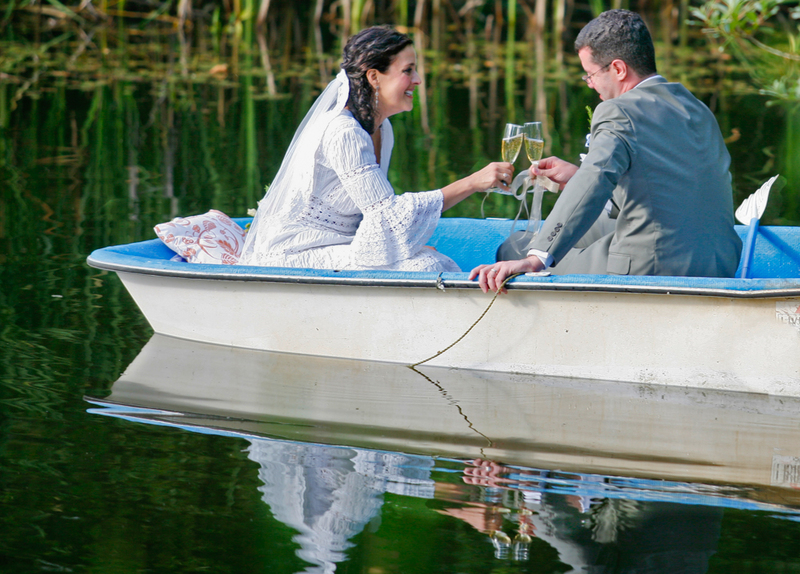 Not only are you faced with finding a new location for your nuptials, you need to secure a spot that is available on the same date as the first place you reserved. This is the scenario Big Papa and I were up against six months before our wedding when the B&B, where we were going to hold our ceremony, informed us they had to back out. The City of Bainbridge Island, where the B&B was located, had decided to uphold an old (and previously unenforced) ordinance preventing B&B’s from hosting events on their property, at least without paying a hefty fee in the order of several thousand dollars. We found ourselves scouting for a new locale, one that–hopefully–had July 28th open because that was the date for which we’d shored up our caterer, photographer, florist, wedding night B&B and officiant. Several weekends were spent visiting prospective wedding sites, trying to find somewhere that had the date and felt like a good fit–ideally–a place where we could house our elderly relatives so they wouldn’t have to shlep to the ceremony and then back again, crisscrossing Puget Sound on Seafair weekend. Our situation was looking star-crossed until one day, I called a B&B where some good friends were staying to make plans to rendezvous with them during their visit. A week later, we made a trip across Sound, to Poulsbo. The place, Morgan Hill Retreat, looked lovely: northwest-styled home on a generous piece of land with a view of the Olympics and a large old cedar tree and a cute little pond beside the house. We told her the specifics: small wedding, July 28, rooms for our parents to stay, and a contract was written up. Time passed. More plans were laid. The wedding neared, one month and counting down. That’s when we received an email from the B&B where we were going to spend our wedding night. Seriously?! We immediately contacted every bed and breakfast within 20 miles. Booked. No room at the inn, any inn. Joking, we told Marcia we might end up spending our wedding night in the barn with the llamas. Star-crossed again. With a couple weeks left to spare, Marcia called us and said she’d found a couple who were thinking of starting a B&B. They had a room over their garage where we could stay. I kissed Big Papa goodbye, with the agreement we wouldn’t speak to or see each other until our ceremony. Big Papa spent the night in Poulsbo with his best man and I rode the ferry back to our home in Seattle. Wedding Day. Big Papa and his best man took a leisurely drive to Port Townsend. I treated myself to a relaxing massage and then boarded a ferry to Bainbridge with a friend, where we would do a bit of wine tasting before I had my hair done, and headed to Morgan Hill for our wedding. At 2:47, a time neither of us will ever forget, Big Papa got a phone call from our officiant. “Pull the car over!” Big Papa yelled. I am thankful I wasn’t in his shoes. Instead I was at Eleven Winery, several sips into a wine tasting. My friend’s phone rang. She listened and look worried. Very worried. I got the news. No officiant. Three hours before our wedding. Why? Why us? I wailed. Sarah, the wife of the winery owner, offered to pour me a full glass of whatever wine I wanted. If ever there was a star-crossed wedding, it was ours. In that moment, it was hard for my mind not to wander…and wonder. Is the universe trying to tell me something? I am still amazed that Sarah was able to think so quickly on her feet and post “Urgent! Officiant needed” on IslandMoms, and even more blown away by the fact that someone responded and managed to get there with 30 minutes to spare. 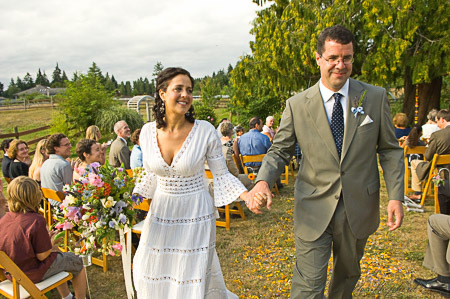 Debbi was so calm, so centered, and pulled off our wedding without a hitch. She even knew several of our guests. In fact no one, aside from the wedding party, knew she Plan B until I gave my thank you speech at dinner. 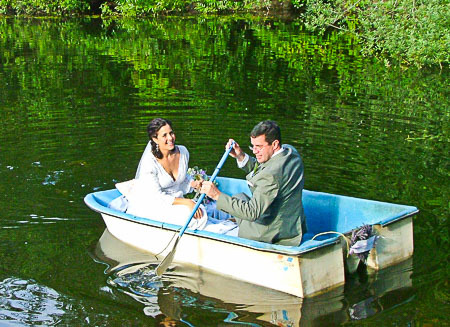 We said our vows beneath the ancient cedar, and then spent our first minutes as husband and wife toasting our good fortune in a rowboat on the pond, a rowboat with one oar. How fitting, because all along it felt like we were up that creek without a paddle. Yet in the end, the stars aligned. Eight years later I believe it was meant to be. All of it. I can’t imagine a more beautiful place to be married, or a finer person to marry us. Even the room above the garage, where we spent our wedding night, was just the right spot. 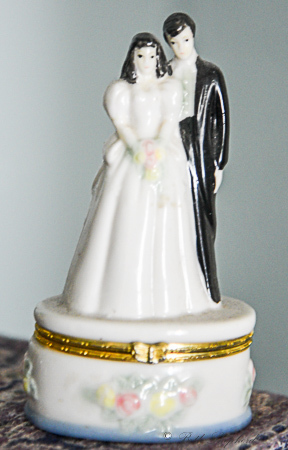 On our nightstand the B&B owners left us a bottle of wine, a card, flowers, and a vintage porcelain trinket box topped with a bride and groom. Whenever I’m not wearing my rings, I place them inside the box, look at the bride and groom, and remember all the people who came together to help us become exactly that. 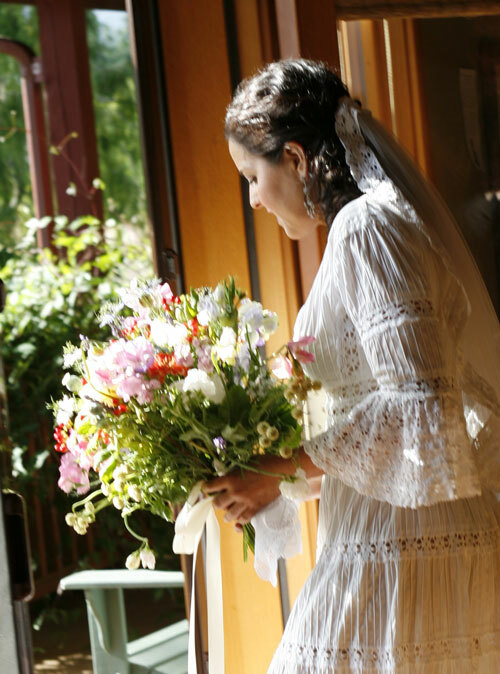 Five years ago, as I dressed for my wedding, I slipped a vintage 1960s Mexican wedding gown over my head, and placed my rose-gold engagement ring, circa 1880, on my right-hand ring finger. 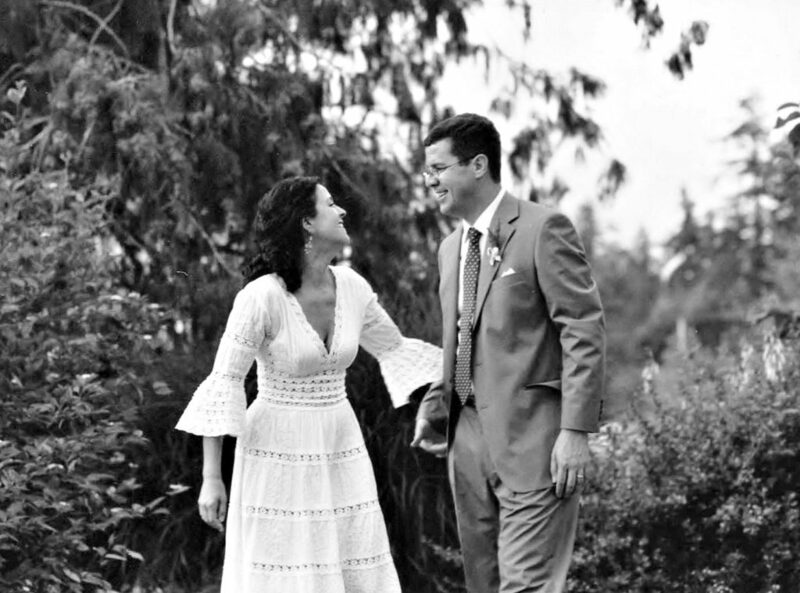 On my feet were brand-new espadrille sandals and my new wedding band was tucked into in the suit pocket of our best man, Tom. With great care, I pinned a delicate broach to the back of my dress, borrowed from my dear friend Dee, who was too ill to attend our wedding. Something old, something new, something borrowed. Yet something blue eluded me, even though it would be a fair to say my mood was blue in the moments before I said “I do,” certainly not what you would expect from a bride on her wedding day, but understandable given our officiate had called to tell us she would be unable to make our ceremony, a mere three hours before we were supposed to say “I do.” In those hours, the sky was filled with dark gray clouds, rain threatened, and gray crept into our spirits as we faced the potential of a wedding without someone to marry us. With less than an hour to spare before our ceremony, we received a response to the “Urgent: officiate needed” message Sarah, owner of Eleven Winery, had posted on IslandMoms, a Yahoo chat group (the winery’s tasting room is where I had been when I received the bad news about our original officiate). 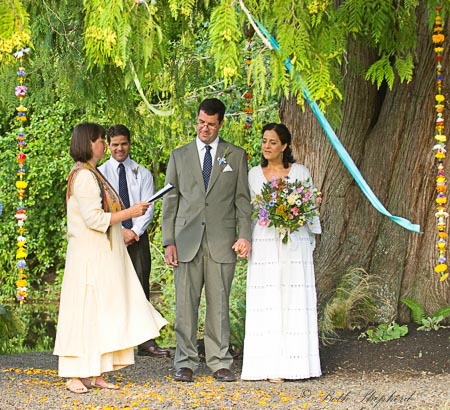 Soon after, the clouds lifted and sunshine warmed the shoulders of 48 guests seated facing the little pond that backed up to ancient the cedar tree, under which we were to become husband and wife. The sound of Louis Armstrong’s What a wonderful world filled the air as I took my first steps out the door and down the stairs of Morgan Hill, walking slowly toward the cedar tree, where Big Papa stood waiting for me. Our newly-found officiate was smiling by his side. My eyes brimmed with tears as I walked, catching glimpses of smiles from family and friends. 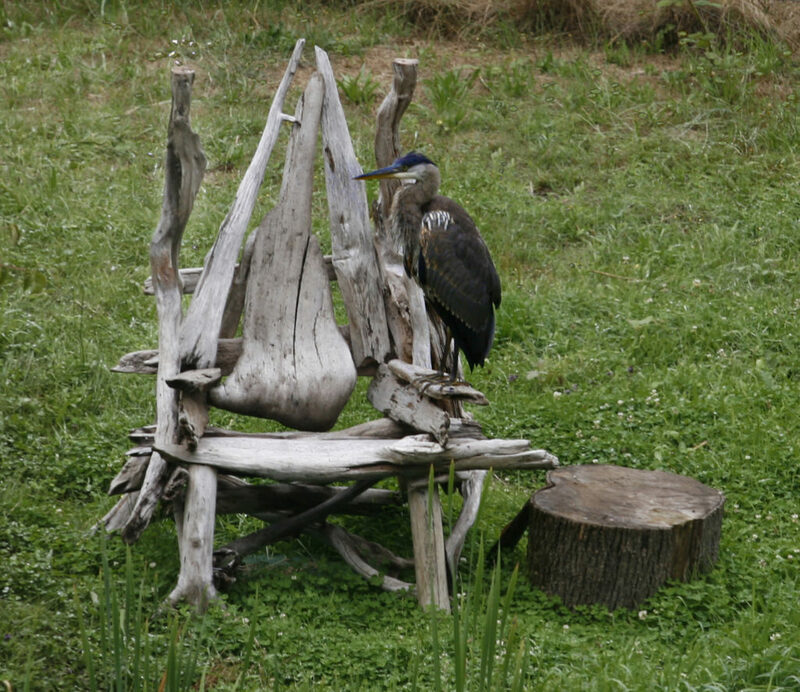 At that moment, a juvenile great blue heron flew in and perched atop a rustic log bench, clearly a guest and visible to all who attended, save the bride and groom themselves. We faced each other, sheltered by the giant branches of the big old cedar, unaware. The heron sat and watched as we promised to love and care for each other for the rest of our days. He sat and watched as we exchanged rings, tokens of our commitment to each other. He sat and watched until we kissed, husband and wife at last. And then he flew off. As we celebrated the first hours of our marriage, guest after guest shared stories of the heron who visited our wedding. Maybe he was there in spirit, a winged representative for those who were unable to join us on this day, because they were no longer in this world or too sick to travel. Or maybe his appearance foretold of one who might become part of our lives a few years down the road. Our heron is one of my most cherished memories from our wedding day. Something blue. My first date with Big Papa was a ferry ride to Bainbridge Island, our second date was dinner at a Cajun restaurant, and our third date was an afternoon of yard work. It was mid-January and I remember spending a few hours outdoors in the brisk air raking up the leaves that covered his small backyard like a wet brown blanket. It felt so comfortable, the two of us working side by side, and I thought to myself: I could be happy with a lifetime of days just like this, with him. When I look back over the six years we’ve been a couple, four now as husband and wife, my fondest memories are often the simplest of moments. While I love romance as much as the next girl—dinners out, vacations to exotic and interesting locales, I’m continually reminded it’s the day-to-day living, rather than grand gestures, that truly cement a relationship. For one, it’s not possible to exist indefinitely in a heightened state of passionate escape. Laundry needs to be done, groceries have to be purchased, and that little thing called life manages to jolt even the most starry-eyed lovers back to reality. I’ve heard people say the true test of a relationship is to take a trip together, see how compatible you really are by putting yourselves in unfamiliar territory while having random unexpected situations thrown your way. I think there’s some truth to this, but also believe you can just as easily find out what your relationship is made of by facing the mundane negotiations of everyday existence, with a few extraordinary catastrophes thrown in for good measure. In my experience, it’s a lot easier to like someone while suffering from jet lag and sipping espresso at a café in Paris, than after a long, stressful week at the office. That being said, we’ve had ample opportunity to see how our relationship will fare when faced with the trials of life on the road…or in a boat. Big Papa still reminds me that he suggested a ferry ride for our first date, because he figured if we didn’t like each other one of us could head to the bow and the other to the stern, and never the twain shall meet again. Fortunately, that’s not how our date ended. We’ve traveled together to Canada, France, Armenia, China, Tibet, Hawaii, California, the east coast, and all over the Pacific Northwest. But the one trip that stands out as a testament to our relationship is the trip we took barely two months before we were married, when we flew to Tampa, Florida and then drove to Ocala, to move my elderly disabled father out to Seattle. He had just been released from a rehabilitation facility where he’d been off and on the past few years due to a series of falls. “Operation spring-the-Pop” is what we called it. Fly out on a Friday, pick him up from the rehab facility on Saturday, pack what we could into the four empty suitcases we’d brought with us, and fly back to Seattle with him on Sunday. On the first leg of the journey from Tampa to Charlotte, North Carolina, dad did just fine. Then, soon after take-off on the second six-hour leg of the journey, he started complaining of pain in his chest and abdomen. Worst case scenarios played through my head and I chastised myself for underestimating the enormity of this undertaking. Soon my father was in considerable pain and asked to be taken to the toilet. Big Papa had bought us first-class tickets, so that in the event of a bathroom jaunt, we wouldn’t have to wrestle my paralyzed father past scores of other passengers only to wait in a long line for the loo. Unfortunately, dad had the runs for the remainder of our trip. I stood holding a blue airplane blanket between my outspread arms to block the view from the other first-class passengers because my father, with his paralyzed leg in a brace, couldn’t fit in the bathroom and close the door. Right beside him stood Big Papa. He cleaned and changed my father, and then cleaned and changed him again for the duration of the flight. First class passengers who needed to use the facilities were diverted to the back of the plane. Thankfully, no one made a fuss and most of those sitting with us in the small first class cabin seemed sympathetic to our plight. It was a tough journey, the first of several we’ve experienced together. If there had been someone available to marry us on that plane, I would have said “I do” on the spot, at 30,000 feet. There is nothing anyone has ever done for me that speaks such volumes about the content of their character. If Big Papa could do this for my dad, I knew he would stand by me—for better or for worse. 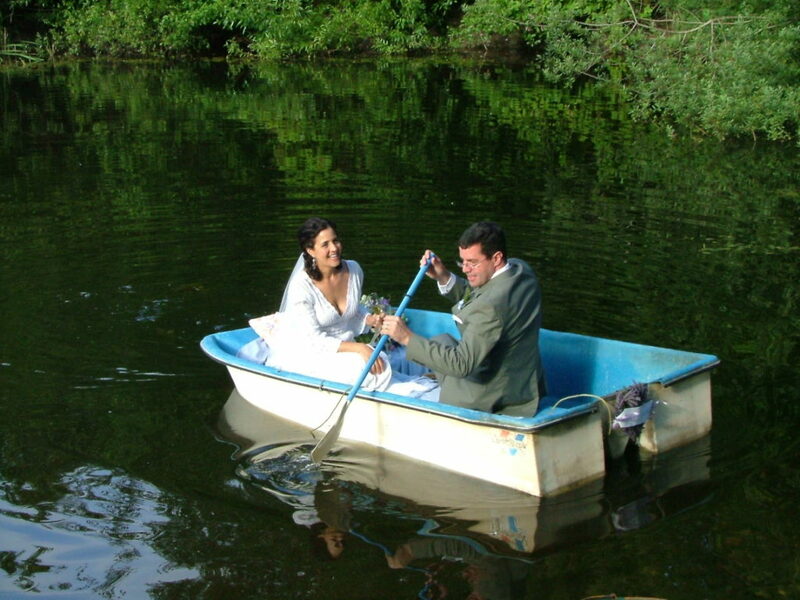 Of course, as some of you might remember from reading my blog, our wedding was one unbelievable fiasco after another. The first wedding site canceled six months before our ceremony, then the B&B where we were going to stay for our wedding night went out of business a month prior and finally, our officiate canceled merely three hours before we were going to exchange our vows. When we managed to find someone to pronounce us man and wife, with barely an hour to spare, and I walked toward the man I would marry, tears rolled down my cheeks, tears of joy. Sure, I wish the road to matrimony had been smoother. Who wouldn’t have? And, yes, there have been many days since, when I’ve desperately hoped for a break from all the crises and heartache we’ve experienced. The thing is, no one gets through this life, or a marriage, without loss, without disappointment. Some are hit with more than others, but none of us escape entirely. In the midst of what sometimes feels like unrelenting challenges, I remind myself how lucky I am in so many ways. Finding Big Papa is one of them. For much of the year here in the Pacific Northwest, clouds roll in and the rain comes down. Sometimes it lasts for days on end, this year right through summer. And then, from time to time, there are glorious days when the sun appears and Big Papa and I head together into the yard, now our yard. Side by side we tend to our garden and care for our plants. They continue to grow, despite the hardships they encounter, and so does our relationship. A marriage is for better and for worse. But mostly it’s for everything in between. Whether we’re on the high slopes of Everest or at the top of the hill in the Central District, I’m so glad you’re traveling beside me. 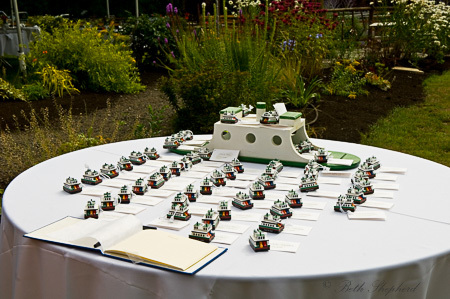 Weddings are momentous occasions. Two people begin their lives together. 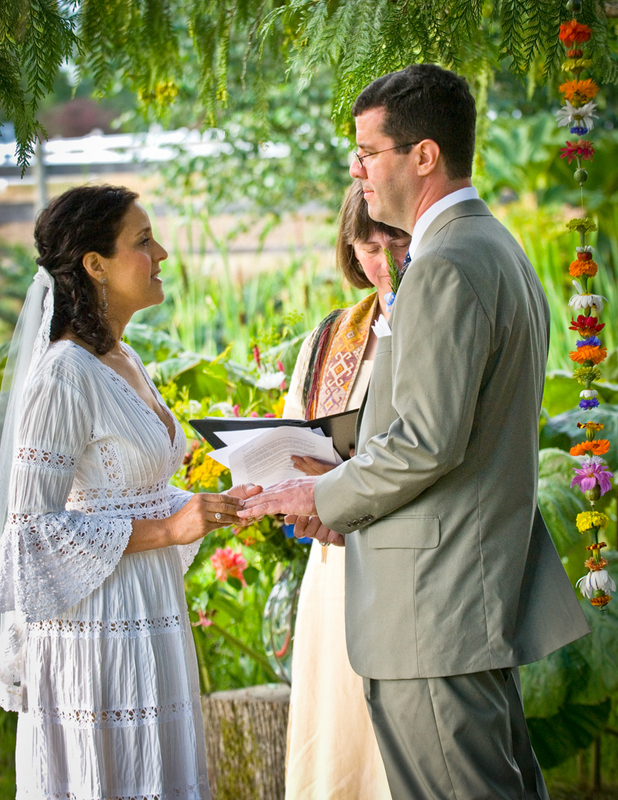 Sacred vows are shared before a community of loved ones and friends. A commitment is made to honor and care for one another for a lifetime: through sickness or health, for richer or poorer. Big Papa and I said our vows to each other merely three years ago. At 48, and marrying for the first time, I could hardly be described as young or naïve. I’d been around the block enough times to know that life can throw some serious curveballs that test one’s mettle much less a relationship. I’d seen my own parents’ marriage dissolve amidst larger-than-life crises: a husband paralyzed by a stroke and a daughter who had cancer twice as a child. Even the best of relationships sometimes break under strain. Yet I also knew relationships that withstood gale force winds and came through on the other side even stronger than before. So as we prepared for our wedding, we chose two couples, whose relationship we admired, to say a few words and offer wisdom that we could draw on when times got tough. I asked my closest childhood friend, Dee, and her husband Gaylen. They had been married nineteen years and Dee had been through a first bout and now a recurrence of breast cancer. Big Papa asked Bill and Pat, whom he’d known for six years. Bill had served on the same WWII ship that Big Papa’s father also served on. Bill and Pat had been married for 63 years. As it turned out, neither couple was able to be there with us as we said “I do.” Dee and Pat were each struggling with illness and a cross-country trip was out of the question. But, they were there with us in spirit. Shortly after they each called to let us know they’d be absent, a package arrived from Dee. In it, was a small antique pin that Dee’s mother had given her. Dee told me she wanted me to have it to wear on my wedding day. A few weeks later we received two letters, first one from Pat and then one from Bill. Pat shared letters with us that she’d written to Bill over the years: one from the days when he was away at sea and she was waiting for him to return and another where she wrote to Bill describing some of the challenges they’d been through together over their many years of marriage and how they’d managed to overcome them. Bill’s letter offered wisdom and support, along with a few tips of things he and Pat had done over the years to ‘hold tight’ when their spirits sagged. On the night before we got married, Dee called me to personally relay her best wishes and ask if she could send an email with a note she and Gaylen had written for us to read during our ceremony. Big Papa and I gathered up these words from our friends to share with each other and our guests on our wedding day. And what a day it was! We’d already managed to find a new location to hold our ceremony when our original site canceled some six months before. A second B&B was lined up for our first night together as a married couple when the B&B where we’d intended to stay announced they were going out of business, just two months before our day. But when our officiant called Big Papa to say she wouldn’t be there to pronounce us man and wife just three hours before the ceremony…well, you can imagine that we were already putting the “through good times and bad” to the test. It’s fair to say that in the process of getting married, we ran into a few catastrophes. And yet, miracles happened too, not the least of which was that a post, “Urgent! 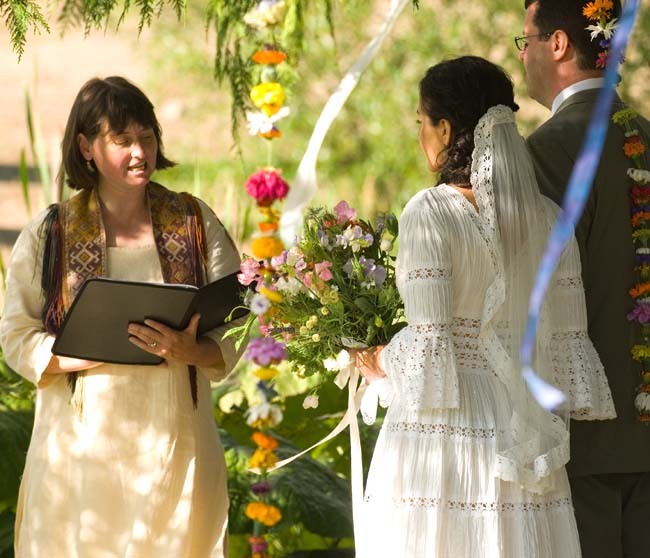 Officiant needed!” placed on IslandMoms, an internet chat group, turned up Debbi, the just-right-for-us officiant who made it to lovely Morgan Hill Retreat with minutes to spare. Lo and behold Big Papa and I became Mr. and Mrs.
Three years later we’ve experienced our share of trials and tribulations. We moved my elderly disabled father across the country two months before our wedding and overseeing his care (and him) has not been easy. Our adoption journey has been the source of many spirited and dispirited moments along with some pretty significant stress. My dear friend Dee passed away as did my beloved, nearly 18-year-old cat, Madison. We powered through a home remodel where we lived in one room and didn’t have a shower for four months. Our car was totaled in front of our house. And yes, like most couples, we’ve had your typical run-of-the-mill arguments. In equal measure, we can lay claim to hours of sheer joy and days filled with playfulness, wonder and deep abiding love. Adventures to beautiful places both near and far have been ours: Tibet, Armenia, Willamette Valley and the California coast. Our home, the Urban Cabin, is now filled with light and a peaceful green oasis greets us outside our back door. We have enjoyed many amazing meals – some with food grown by our two hands and wine discovered on trips through the Pacific Northwest. Our understanding of ourselves and each other has improved by leaps and bounds and together we’ve tackled challenges and worked toward achieving our dreams. Truly, it’s the marriage, not the wedding that that those vows are really all about: the day in and day out meandering along in the world, looking out towards the future, remembering the past and enjoying the here and now. I can almost hear Bill encouraging us to hold hands each night and try not to go to sleep angry with each other. I can see the images described in Pat’s letter: how sweet Bill is when he brings her coffee first thing each morning and how he stood by her during a long bout of depression. When we exchanged marriage vows, I hoped that – on the balance – “health” would outweigh “sickness” and “good” would be more prevalent than “bad.” I still do. But no matter where the road may take us, I believe in the vows we said to each other and I believe in us. …It will not always be smooth sailing; your relationship will be challenged. But in our experience, the process of weathering these storms will only serve to deepen and enrich the feelings that originally brought you together. Happy Anniversary Big Papa! How lucky am I to travel through time with you by my side. A 30-something year old friend of mine was married this past weekend. It was a good-sized affair, with nearly 200 in attendance. 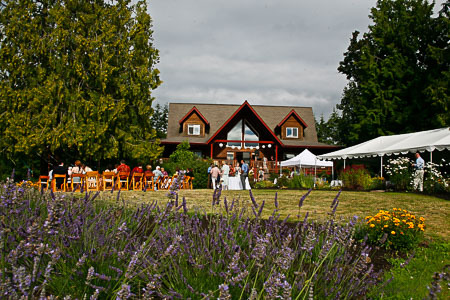 The ceremony was outdoors at the Columbia Winery. After they tied the knot, we milled around the tasting room before we were ushered into the dining area with roughly twenty round tables, each holding eight guests. Once nestled into our seats at Table 16, Big Papa and I were relieved to be sitting next to a couple we know and like. We always have a good laugh together and feel at ease, plus they are in the loop on the details of our lives such as when we got married, where we live, and our pending adoption. Otherwise, truth be told, Big Papa and I find events like this uncomfortable. That awkward moment when you’re seated next to strangers or standing at the buffet line. We know we’re connected to each other by a few degrees of separation, yet it can be dicey getting conversation started. In the many years I spent as the perennial single girl in so-so jobs, gatherings like this were excruciatingly painful. I felt like I had a scarlet ‘S,’ for single, plastered on my dress. As my solo years stretched into my forties, I was all too aware that I was the which-one-isn’t-like-the-others at most bridal and baby showers. When people ask, ‘Are you married?’ or ‘Do you have kids?’ I understand they’re not trying to be judgmental, but rather searching for a common bond, and a launching off point to share their own story. Still, I feel challenged not to feel “less than” when I can’t respond in kind. For me, the sadness I would feel as I drove myself home was that I wanted to be able to talk about my loving husband, share pictures of my dimply-faced child and talk proudly about my career accomplishments. Each time, as I mulled over my post-revelry depression, I’d remind myself I need to come up with a cheery elevator story for the next event. It’s not that I have no appreciation for the grand diversity of life circumstance and the path that is uniquely ours to claim. Life isn’t a competition. Our stories unfold in their own time and at their own pace. Marriage, jobs and kids aren’t like Girl Scout badges of honor. Not having one or any of the three doesn’t signify lack of ability, motivation or character. I’ve certainly seen enough marriages implode and parent-child relationships that struggle mightily. I know that what you hear in cocktail conversation doesn’t always match up to what’s going on behind closed doors. Still, I admit that I struggle with not feeling like a member of the club when I attend celebrations like weddings, baby showers and class reunions. These days, my life looks quite different than it did just a few years ago. I walked in to this wedding on Big Papa’s arm. We’re in the midst of adopting a child. We live in a cute, little house. I spend a good percentage of my time writing, which truly satisfies my soul. So, you’d think I could upgrade my outlook to match where I’ve transitioned to in life. We left the din of the wedding to walk to our car. I took Big Papa’s hand and gave it a tight squeeze. I am deeply grateful for the love in my life, the roof over my head and the baby waiting in the wings, in Armenia. My life may have taken the longer, winding road, but I’m by far the wiser and infinitely happier with where it’s led me.